I love the flavor of whole-wheat pasta, and I have the patience to stand over the pot while pasta is cooking to get the texture just right. Unfortunately, I’ve been largely unsuccessful with most of the brands of dried whole-wheat pasta I’ve tried. It’s not that the flavor is bad, but I just can’t find that perfect al dente window, when the pasta offers just the slightest bit of elastic resistance when you eat it, but it no longer has a true crunchy bite. 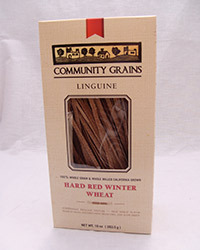 I finally found the magic al dente window in the hard red winter wheat linguine from the San Francisco Bay Area company Community Grains. I don’t know whether it is the wheat itself (California grown and milled), the fact that the whole grain is milled together (rather than separated and then recombined, as is often the case in commercial whole-wheat milling) or that the pasta is cut and dried in the traditional (old-fashioned) manner, but the texture is at once hearty, slippery smooth and chewy, and the wheat flavor is super-prominent. We had it with a sauce of spicy sausage, broccoli rabe and pecorino, which stood up to the almost nutty flavor of the wheat.